As you can read on Eoin Clarke’s excellent ‘Green Benches‘ blog, Tory MP Priti Patel this week called for Scotland to face billions of pounds of additional cuts. Claiming her concern was to balance the ‘Barnett Formula‘ – the calculation that decides how much funding for public expenditure Scotland (and Wales & Northern Ireland) receives from central government – Patel stated that Scotland costs £6-80 billion more than it generates, depending on how the value of North Sea oil is calculated. She identifies the calls for Scottish independence/greater devolution as an opportunity to reset the formula and cut the amount of funding that Scotland receives. Eoin rightly attributes this speech to jealousy and lists some of the many government decisions that are costing us far more than Scotland’s allocation. But I think there’s more to it than jealousy. Without question, a strong driver for Patel’s ideas is the fact that the Tories are more than happy to penalise any area where the people don’t vote for it. Areas such as Middlesbrough, where I live, have faced and continue to face far higher levels of cuts in public spending and services than ‘leafy Surrey’ and other areas that vote, or might vote, for the Tories, in spite of being poorer. Similarly, the idea of regional, or ‘market-facing’ pay in the public sector is designed to cut spending at the expense of already-struggling local economies while protecting the wealthy. The plan, being revived under Jeremy Hunt, to focus spending on age-related care is also intended to favour wealthier areas, where more people live longer – and are more likely to vote Tory. The Tories will fight hard to implement such ideas, even to the extent of lies and subterfuge. However, that instinctive Tory tendency, driven by fear and contempt, is only a pointer to the key aim of Patel’s speech – like the scent of bread telling you a bakery is nearby. This map shows the result of the 2010 general election. The blue areas represent Tory seats – and there has never been more than one in Scotland since 1997. Scotland has 59 commons seats. 41 of them have Labour MPs. Of the 650 Westminster seats, Labour won 258 at the general election and the Tories 308. Take away Scotland from the equation and the numbers would have been 207 Labour, 307 Tory – out of a total of 609. 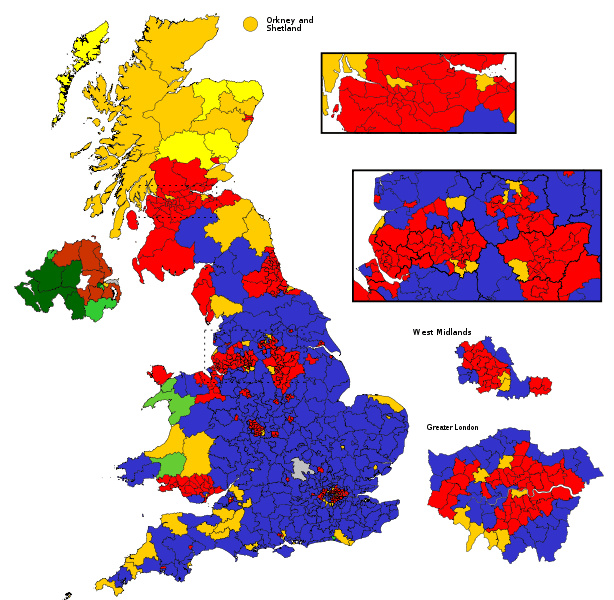 A general election minus Scotland would have resulted in an outright Tory majority – and an absolute nightmare for the ordinary people of England, Wales and Northern Ireland that would make the current one – terrible as it already is – look like a picnic. The Institute of Economic Affairs, who hosted the discussion, is an extreme right-wing, neoliberal organisation dedicated to shrinking the state and enriching the wealthy – the panel chair even touts their book ‘Sharper axes, lower taxes: Big Steps to a Smaller State‘ (for pity’s sake!) that tells you all you need to know about their aims to push further along a path that has already impoverished this country and killed the recovery that was already starting at the time of the last general election..
Priti Patel was on the panel in the video alongside Kwasi Kwarteng – two of the five ‘rising stars’ of the Tories’ right wing who collaborated on a book attacking British workers as lazy and blatantly misrepresenting facts to make their case and who pride themselves on being ready to ‘think the unthinkable’ to achieve their ends. In spite of the Tories’ instinctive desire to maintain the Union (the only union they do like! ), I believe that these speeches were a blatant attempt to fuel the desire of Scottish people to put themselves beyond the reach of the state-shrinking, poor-hating, demonising Tory party. The Tories have failed to get their lusted-for boundary changes that would strengthen their position, they know the electorate is waking up to their venality and corruption – and so they, or at least some of their most extreme wing, are prepared to sacrifice the Union they claim to cherish in order to improve their chances of holding onto power in the rest of the country. We’re going to see more of this kind of comment between now and the 2014 referendum, as the Tory right attempts to push Scotland toward an independence vote. Who can blame the Scots for wanting to get away from the likes of Cameron, Osborne, Duncan Smith, Hunt, Patel, Kwarteng and their ilk? But for the sake of England, Wales and Northern Ireland – and, I believe, ultimately Scotland too – I hope they don’t fall for the ruse. For the sake of ordinary people and our descendants, the British people need to consign the Tories and their neoliberal allies to political history. Scotland can go it alone and leave the rest of us to sink or swim – but that’s straight from the Tory hymnsheet. We’ll do it by uniting against them. ← By just how much is the SW pay cartel planning to cut NHS staff pay? This will end in war I think, of a civil kind. Like the French Revolution but with tech. If the Scots secede, it’ll happen sooner rather than later. Then it will be over. Let them go I say. I understand where you come from, but a desire to fight the Tories and a kinship with the regions of England is not enough for Scots like me to say no to independence. We Scots looked South to Westminster with disdain as Labour lurched to the right in order to capture ‘middle England’ swing constituencies. Then we suffered America’s wars. Then the inevitable collapse of free market capitalism. Then we saw the Liberal Democrats sell their soul and prop up a Tory government. And now the even more right wing UKIP is on the rise along with a real possibility of an EU exit. The reality is there is no ‘left’ in the United Kingdom any more. We Scots can look across to Scandinavia to similar sized nations like Norway and Denmark and see that there is a real alternative. So with that in mind, when 2014 comes I’ll be voting YES. I’m sorry to say the UK is a lost cause, it has been ever since the 80’s. I understand – and we in the north looked at the same things with the same feelings. However, pushing Scotland to secede is a classic case of ‘divide and conquer’ and bodes ill for all of us – including Scotland in the long run, I fear.